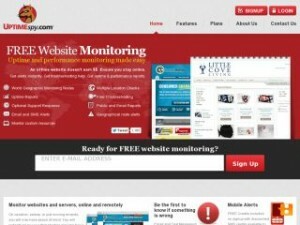 Web Hosting Services – Oklahoma City, Oklahoma – UptimeSpy, a website monitoring services provider, today announced the company is now offering for a limited time 5 free paid website monitoring plans. Customers that signup up for a free account will automatically be upgraded to a paid plan at no cost. A representative for UptimeSpy said, “With Google now ranking sites by response time, it is important to make sure your website is responding quickly at all times.” Last year Google made numerous changes to its algorithm. One of those changes incorporates a website’s page-load time into its rankings so that only the fastest sites are displayed on the search engine results pages. With Google’s recent algorithm changes, it is now possible for ecommerce websites to increase their ranking simply by increasing their page-load times. UptimeSpy’s monitoring service will instantly alert a site owner about any load time issues so they can make adjustments quickly to maintain their rankings.